Today, I have the pleasure of introducing you to Katie from Moore from Katie. This post of hers made me chuckle. 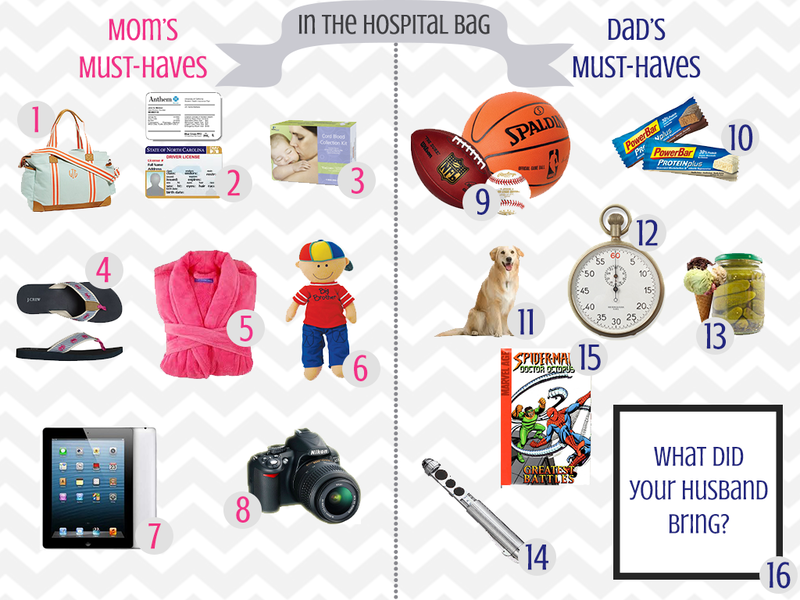 Do you have a good story about what you packed for the hospital vs. what your husband wanted to pack for the hospital? She's looking for some good stories. 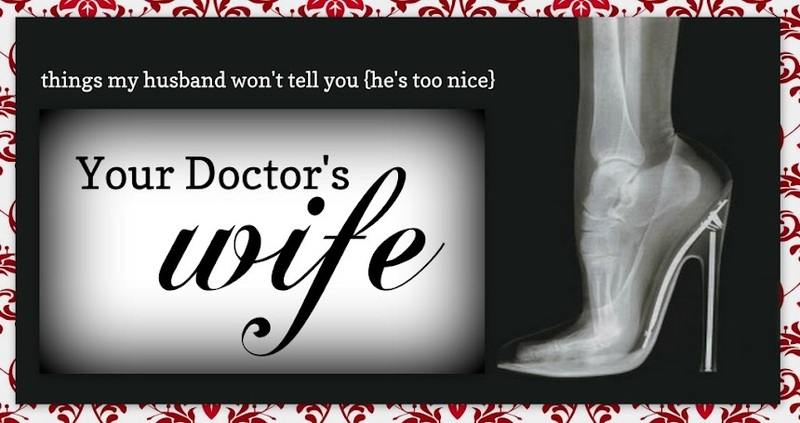 Drop by her blog to share your stories! Enjoy! 2. ID and Insurance Cards: These are a MUST have for the hospital- to ensure they process your paperwork correctly. 4. Flip-Flops: Many of my friends brought slippers, which got dirty quickly at the hospital. I chose flip-flops and they were great! 5. Bathrobe: It's important to be comfortable and a cozy robe is a perfect choice. 6. Big Sibling Gift: Making your first child feel involved is very important. 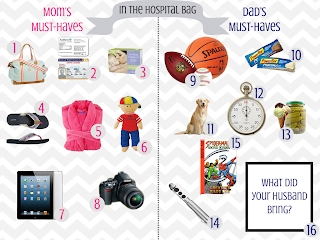 Bring his/her gift to the hospital for their arrival! 7. iPad: Comes in handy to Skype and e-mail! 8. Camera: My husband was able to capture some beautiful pictures with our camera. These memories are priceless. 9. Some Type of Ball: "To toss around while waiting for labor", was his explanation. Really? 11. Our pup, Skip: Okay, this is a stretch and I understand where he was coming from but- no dogs allowed! 14. "Neuralyzer": The "memory eraser from Men In Black"...just in case some of the more anatomical memories needed to be erased. 15. Comics: I mean...how many children do I have here? 16. Give It Your Spin! : My husband always kept me on my toes and although he tried to help pack for our delivery, my suggestions were a little more practical. Feel free to share what your husband brought in the comments section below! I remember I brought a whole bunch of stuff I didn't use or need! I only packed for after the delivery since I had scheduled c-sections so killing time things weren't really necessary. What a fun post!